[By Nick] In my ongoing attempt not to review something Dubba already has or is going to do, I’m led to review one of my new standbys: The Double Chocolate Klondike Bar. I have no idea when these were released but I got my first taste of these last year and have placed these into my ice cream novelty rotation (yes I have a rotation, don’t judge me). What could possibly make chocolate better? Double up the chocolate of course! On first look, it seems just like any ordinary Klondike bar. Once dissected*, you have the classic Klondike shell in all its glory but instead of encasing boring old vanilla, you’re greeted by a rich, semi-dark chocolate ice cream. Now this is far from premium stuff but the light chocolate ice cream lends itself nicely to this application. The chocolate shell and ice cream seem like they’d just be overkill and blend into one another. That’s where you’d be wrong my friend; the two chocolates are able to separate themselves from one another, creating a delectable treat. 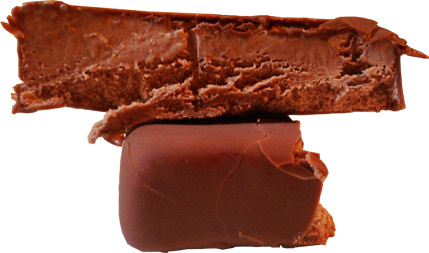 The shell itself is the standard milk chocolate variety but after looking at the ingredients, the only chocolate involved in the ice cream is cocoa. This gives the ice cream a darker, slightly bitter feel to it, contrasting nicely with the shell. Now don’t go thinking it’s extremely dark, it’s still has milk chocolate qualities but with a hint of dark to distinguish itself from the shell. This isn’t a mind blowing treat by any means but it satisfies any chocolate cravings you might have. That’s the only thing that matters when it comes down to it. What would I do for this Klondike Bar? Nothing much, unlike what I would do for say a Caramel Pretzel Bar. It would still fall somewhere in my top five Klondike treats though. It’s a good treat to reach for when you want chocolate but not something extremely decedent (i.e. Magnum Double Chocolate Bar). At this point I'm feeling pretty silly for never trying these. I would always try the other new flavors first. I just tried these tonight and Nick is spot on when he mentions the two chocoltes being completely different. I actually think I dislike the other kinds of Klondikes because the flavor usually detracts from the shell. In this treat, it enhances the flavor. Almost reminds me of a chocolate sundae wih hershey's syrup. Honestly it may be the only ones I'd buy again! Good to know someone agrees with me=]. Before you shun all other klondike bars though, give the caramel pretzel ones a try. Those are by far my favorite. Four years after you, I decided to try these. Your review is spot on and these bars are addicting and enjoyable. 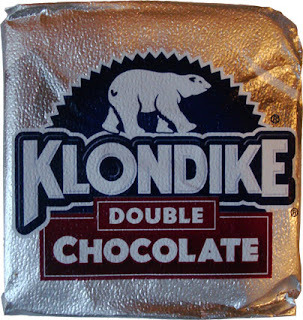 While it sounds like a boring flavor, they are my favorite Klondike bar. Chocolatey on top of chocolately, these are amazing! For once, we share the same opinion! When I was a little girl, Klondike bars were Eskimo pies with chocolate instead of vanilla. Much much better. I've been wishing they'd bring chocolate back since my teens. I just found Klondike Double Chocolate in my local Walmart'a freezer case two days ago. They're so much better than I remember! It may not be premium, but it's better ice cream than this kind of treat usually gets, and the combination of shell and ice cream is oh, so good! Yum!